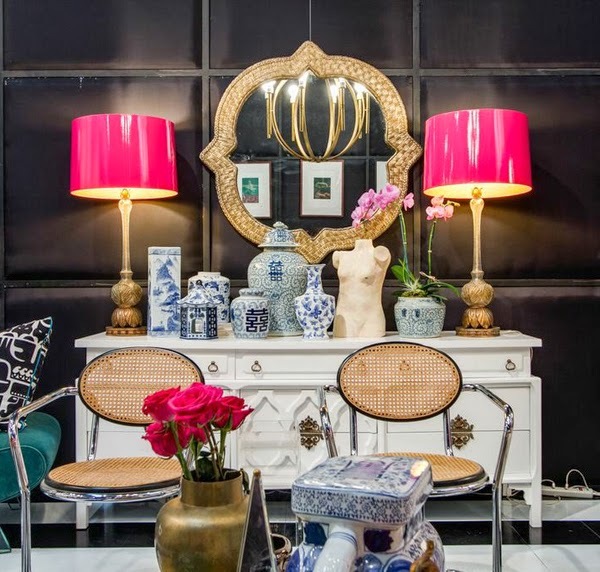 Chinoiserie Chic: Can Black Be Girly? 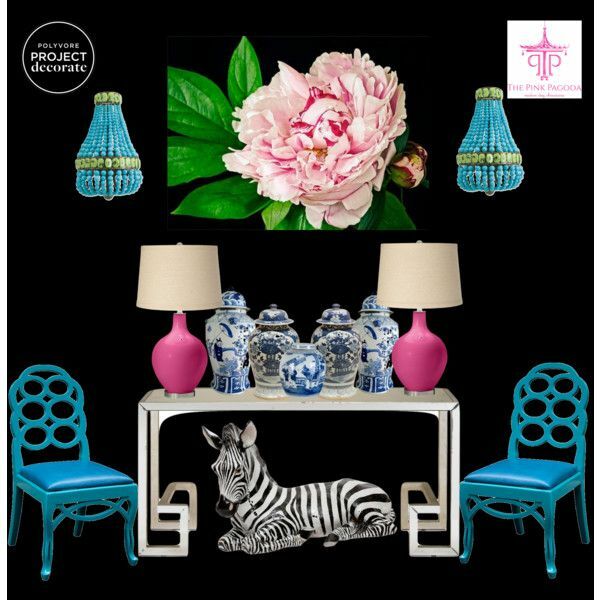 This week we are looking at the feminine side of Chinoiserie. In fashion, I think everyone will agree that there is nothing more feminine than the little black dress, yet this is not the perception in interior design. 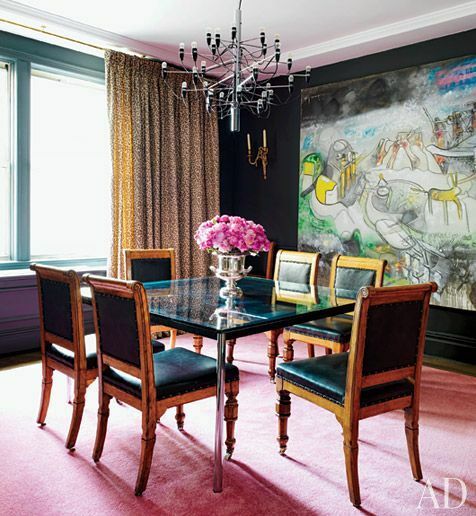 We tend to think of rooms with black walls as modern, urban, moody, and somber. Yesterday, The Pink Pagoda posted on this room below by Leslie Pritchard. 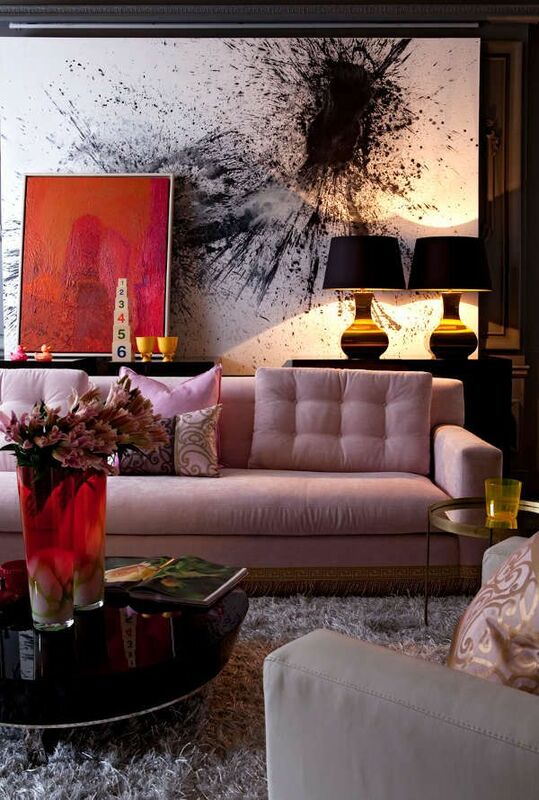 Check out the black walls with lots of pink and loads of Chinoiserie. Not the least bit masculine, right? It motivated me to create this board above for The Pink Pagoda's Polyvore contest - "Art-Filled & Feminine." I hope you have entered to win a $500 gift card from Horchow - you can enter as many boards as you wish. Jennifer featured my board today on The Pink Pagoda as well. 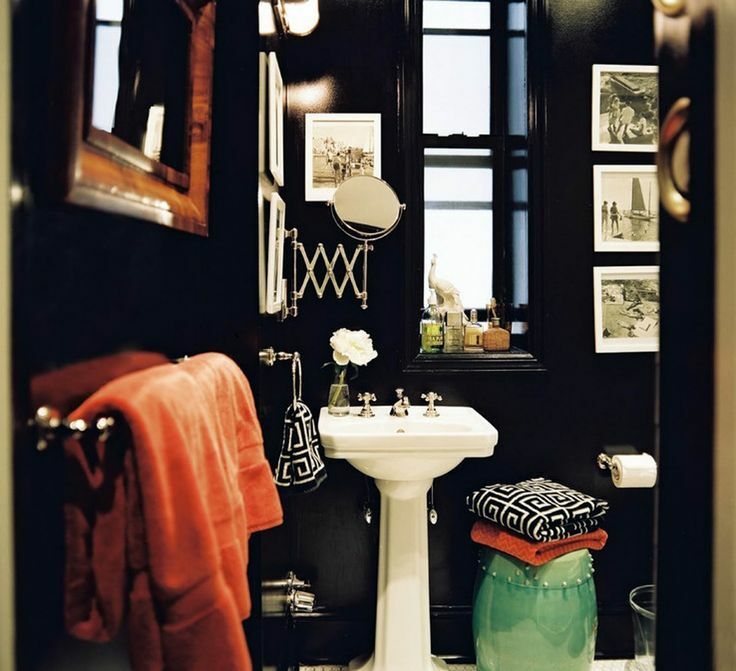 I have also included more examples of feminine rooms with black walls. 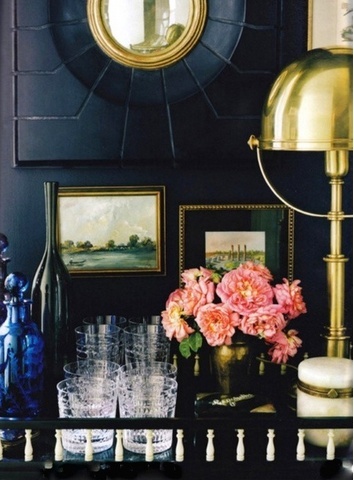 This has me rethinking black walls - just add pops of color and Chinoiserie! OK, I'll bite. I grew up girly-girly. When I decorated my room as a teen, it was pink and green. My matron of honor wore pink at my wedding. I love all shades of pink in my garden. I still adore the chairs I inherited from my MIL. Pink of course. And yes I am painting all of my downstairs black. For over 25 years, it was all white. As it became too trendy, and wanting a different look that still went with my old furniture, I kept coming back to black. It shows off moldings. It's a great background for art. 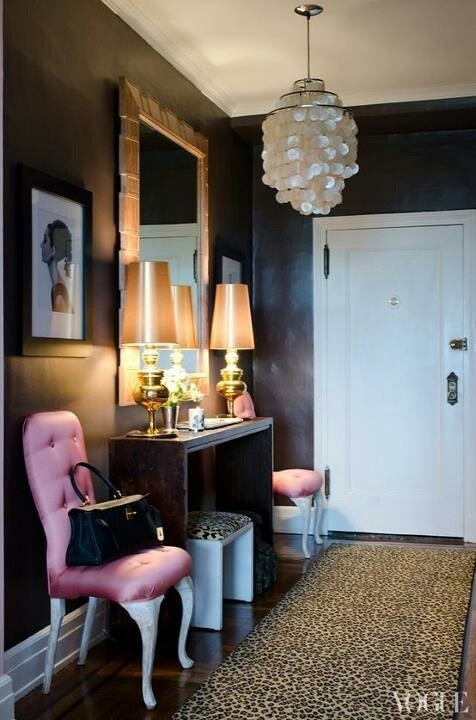 And those pink chairs look great against the updated black. It's not a "goth" look. It is a quiet, elegant look. I'm looking forward to everything being done, but as the black paint starts to take off the first floor, I have to say, I'm in love. So Elegant - Sophisticated and Feminine -because of the contrast with lighter colors - Fine Art and reflective suraces such as Mirrors - Crystal and Silver-! I've been so interested to see all of the different interpretations of "feminine" this week with the contest. For me, it doesn't need to be soft. Feminine can be bold, bright and strong. I love these black walls. 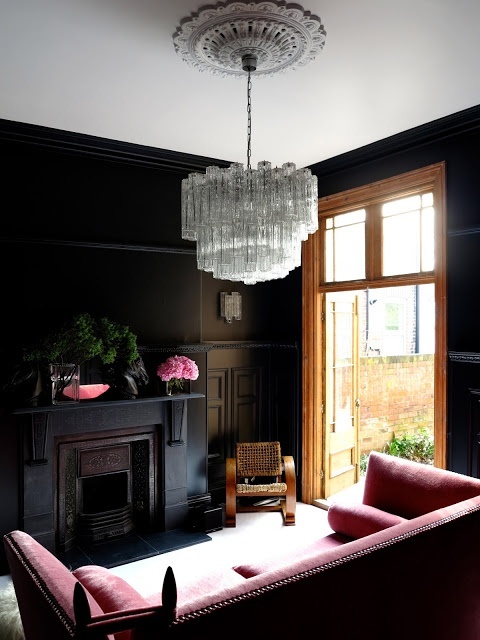 I thought it was great how Leslie used black walls, but still the space looked bright, happy, pretty and feminine. Black doesn't have to go moody.